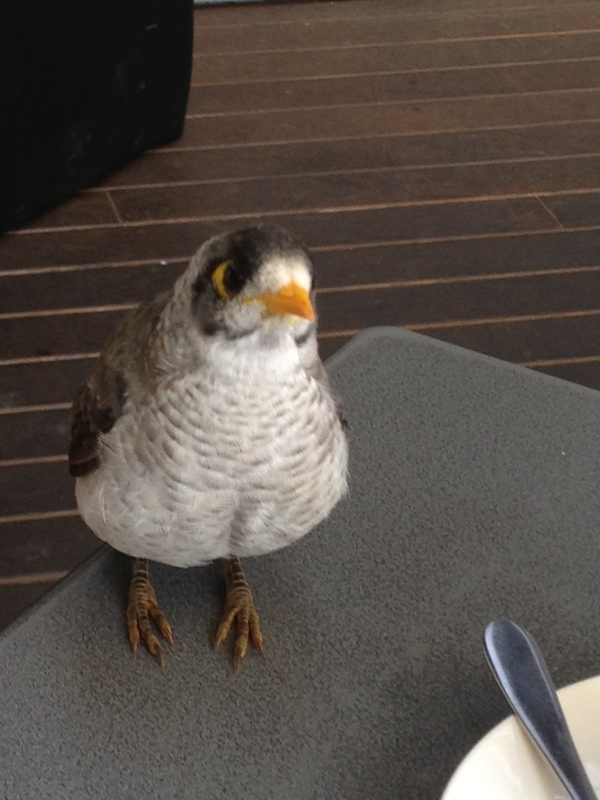 As I sipped a coffee yesterday, killing time, with worries on my mind, a little Mickey Bird (Noisy Miner) came to visit me. The Universe must have known I needed some company. The friendly bird stayed with me, singing cheery songs and chatting away until it was time to go. It supported me to feel calm, supported and loved. And it helped me feel the presence of Little Auntie, one of my favourite Aboriginal Aunties, whom I also knew as Little Bird. We are never, any of us, truly alone. This entry was posted in Life and tagged Aboriginal Aunties, Aboriginal wisdom, birds, friendship, mickey bird, nature, noisy miner, oneness by Cauldrons and Cupcakes. Bookmark the permalink. Oh what a blessing! What a darling little bird that came for a visit. Are they fairly tame? How beautiful Nicole! I really love today’s blog 🙂 thank you! I’m so glad little bird (auntie) did that, what a lovely experience it must have been. sending you lots of love and healing..
Is he not the sweetest little stranger Nicole . I have felt alone this week . Had problems with my computer but have discovered wonderful people in Starbucks that have helped me get on line . Sometimes you loose some things and gain other things that are a whole lot better…no we are never alone… there are such kind people out there .. 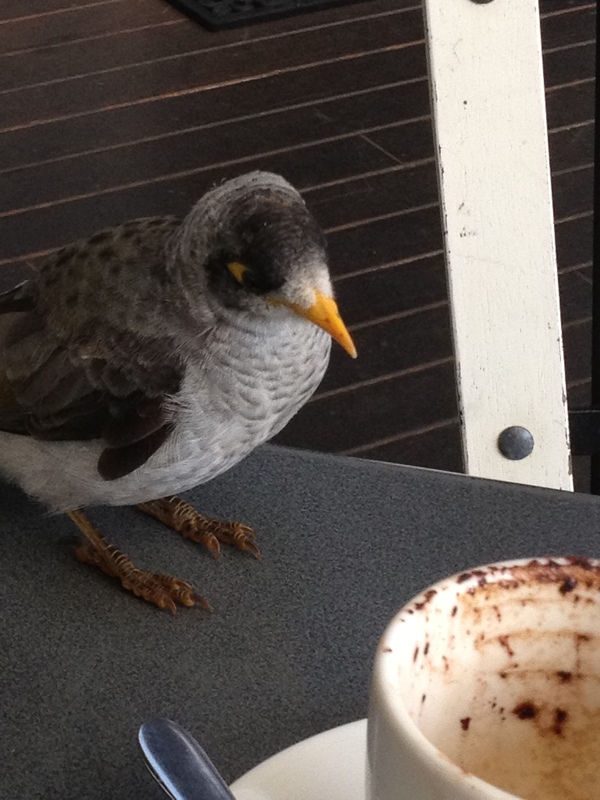 I just love birds coming to tables at cafes. Such a lovely little bird. Obviously felt very safe being in your warm vibration.